Fleetwood boss Joey Barton was pleased to see Ched Evans back from suspension and back among the goals with the first two in Town’s 3-0 win at AFC Wimbledon. Town ended a run of eight away games without a win in League One as they defeated the bottom club and jumped four places to eighth. 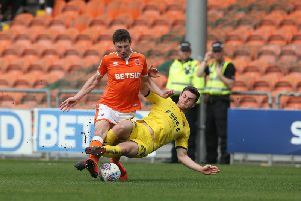 Evans was back in the side after a two-match ban and replaced Lewie Coyle, who started a three-match suspension after Town’s appeal against his red card at Rochdale on Saturday failed. Barton said: “I thought we were excellent and are probably a shade unfortunate not to score at least another couple of goals. “Ched had a few chances with a one on one and so did Paddy Madden and Ashley Nadesan. “Our front three were magnificent and I have to say it was a real team performance. To win 3-0 away from home is always pleasing. “Ched was great and there was a lot of good work done from Ross Wallace and Wes Burns, who was playing at right-back due to Lewie Coyle’s red card. “Wes has been fantastic since I have been at the club and he can play in multiple positions. His performances have been admirable. It was Town’s first win of 2019 and Barton added: “This is what we were crying out for, and I do think the lessons we are learning and all the hard work on the training ground is starting to pay real dividends. “Wimbledon isn’t an easy place to come to and they are fighting for their lives. They have already beaten us twice this season and to perform in the clinical manner we did was very pleasing. “The clean sheet will do us the world of good and the lads policed the game well. “There were moments when we had to defend, especially in the early exchanges of the second half. I think they might have had some stern words said to them at half-time.